FlickStart Tags using movement to target Phone and/or Watch - Sets of commands that can be added to a FlickStart installation to control apps on the handheld or on a connected wearable. Each command will define which of the eighteen movements recognized by FlickStart will trigger the command. FlickStart Tags using movement to target Windows apps - Sets of commands that can be added to a FlickStart installation to control apps on Windows PCs (when your phone and the PCs are on the same WiFi network). Each command will define which of the eighteen movements recognized by FlickStart will trigger the command. See the section on this website describing FlickNet for information on setting up the phone and PC(s). FlickStart Tags using speech to target Phone and/or Watch - Sets of commands that can be added to a FlickStart installation to control apps on the handheld or on a connected wearable. Each command will define a speech pattern which triggers the command when the speech reocgnition process returns text that will match the pattern. FlickStart Tags using speech to target Windows apps - Sets of commands that can be added to a FlickStart installation to control apps on Windows PCs (when your phone and the PCs are on the same WiFi network). Each command will define a speech pattern which triggers the command when the speech reocgnition process returns text that will match the pattern. See the section on this website describing FlickNet for information on setting up the phone and PC(s). 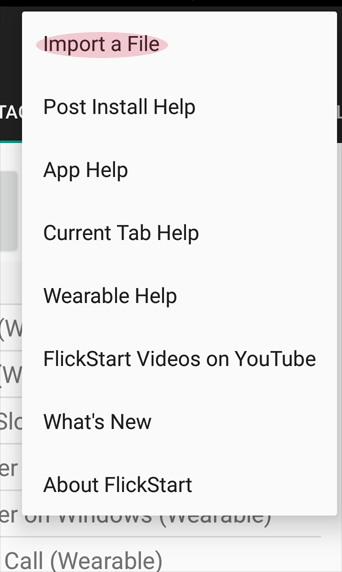 FlickStart Companion apps - These are apps which need to be installed on a PC. The apps act as the PC end of a bridge from FlickStart on a phone through to apps on a PC. Since the companion apps don't install on a phone they can't be downloaded from the Google Play Store. Some of the files are the duplicates (or updated versions) of commands provided with FlickStart and are there in case you accidentally delete or damage your copy of the commands. Others are new command sets that work with more apps or are variations on existing ones. Entries in the table have the most recently added or changed items at the top and oldest items at the bottom.